Non-fiction – Kindle edition; Nero; 338 pages; 2015. 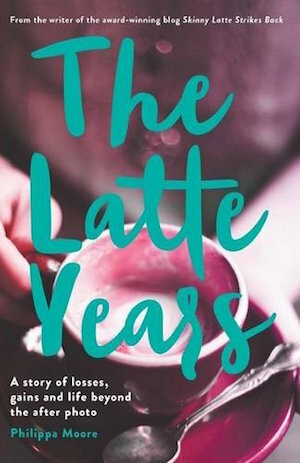 Philippa Moore’s The Latte Years is a memoir about her struggle to lose weight, build self-confidence and live what she calls an “authentic life”. Admittedly, this is not the kind of book that would normally find its way into my hands, but Philippa is an acquaintance and I was keen to read it. Thanks to a half-price Kindle sale last weekend, I purchased a copy and settled down to read a chapter or two. And then I couldn’t put it down. And then I found myself reading it way past my normal bedtime. And then I felt bereft when I came to the end just a day later. But I also felt — and this is the important bit — ready to take on the world. It made me want to sign up for a marathon or write a book of my own. That’s because this is a memoir that is as much about motivation and inspiration as it is about losing weight, getting fit and growing up. The Latte Years is not a step-by-step instructional guide to losing weight. Indeed, losing weight isn’t even the main focus. Instead, this is mainly about the ups and downs after Philippa achieves her goal. This includes a move from Hobart to Melbourne, a marriage break-up, life as a newbie singleton, a trip to North America and then a permanent move to the UK, where Phil got married to her own prince charming. Along the way she makes new friends, loses old ones and learns some harsh realities about taking responsibility for your own life. She also tackles triathlons, marathons and all manner of outdoor pursuits. And she writes an award-winning blog that attracts a supportive worldwide audience — along with a troll or two. It is, by turns, a heart-breaking and inspiring read, reminding me at times of Shauna Reid’s memoir about weightloss, The Amazing Adventures of Diet Girl. It’s written in a relaxed, almost chatty tone, so that you feel like Phil’s right there in the room with you, talking frankly with much candour and a healthy dose of humour. Occasionally the narrative does wander slightly into self-help territory (making me feel slightly patronised, but then I am about 20 years too old for this book), but it’s best when Phil concentrates on explaining her own situation rather than offering advice. It’s a brave book, not least because Phil puts everything “out there”. It’s the kind of story that would be ideal for teens or women in their early 20s that haven’t quite figured out what to do with their lives and lack the courage to pursue their own thing. The Latte Years is available to purchase in the UK and USA. This is my 23rd book for #ReadingAustralia2016 and my 17th for #AWW2016.